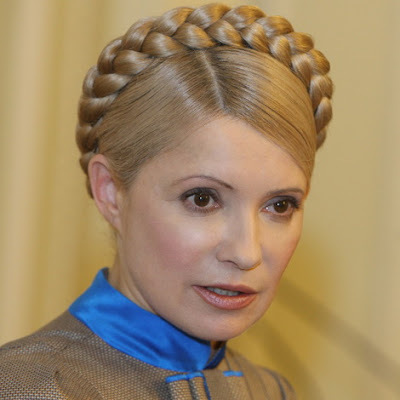 KIEV, Ukraine -- The glamorous Orange Revolution princess and former premier Yulia Tymoshenko may now be in opposition but her ghosts are still haunting the government offices in Ukraine. Or so her successor insists, who said Friday he had had to ask an Orthodox priest to exorcise Tymoshenko's spirit from his office. "It was very hard to breathe in there," Ukraine's Russian-speaking premier Mykola Azarov told reporters on a visit to the eastern city of Dnipropetrovsk. "After exorcism it has become easier to breathe and I entered the office," the Interfax news agency quoted Azarov as saying. The ritual was performed by a priest from the Kiev-based ancient Caves Monastery, one of Ukraine's top landmarks. Azarov, an unassuming career bureaucrat, also said the current cabinet didn't have any women because the situation in Ukraine was too tough for any woman to handle. "At present the situation in the country is rather difficult, and people who can work 16-18 hours a day ... have been taken into the government." "Conducting reforms is not women's business," Azarov said. Tymoshenko lost February's presidential election to Viktor Yanukovych, who came to power on pledges to improve ties with Russia. She has since moved into opposition. Well sexism is obviously alive and well in Kiev! I guess someone should have told former British PM Margaret Thatcher that she was unqualified for a responsible government office because she urinated sitting down instead of standing up.